Stay with us in the beautiful Bay of Islands just six minutes to Russell. Enjoy spectacular sea views from our north facing waterfront property and the vista of our prize winning garden from sunny decks. Watch the sea birds diving and the fish jumping in the bay below. 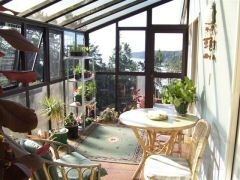 Access to spacious deck with superb sea view. Sleeps four (plus studio room sleeps two). Freeview TV, CD and DVD players.